When faced with drought conditions, communities might depend on water stored in reservoirs. Yet, considerable amounts of water can evaporate from the surface of the reservoir. 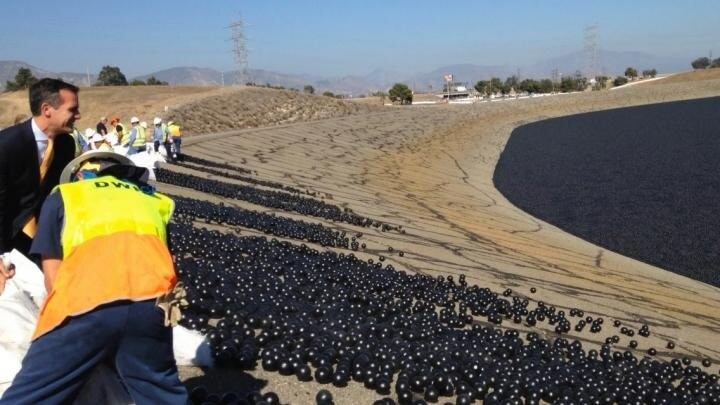 During the most recent drought in California, which lasted from 2011 to 2017, 96 million “shade balls” were deployed on the Los Angeles reservoir. These plastic balls, which are black in color and float on water, cover the surface of the water to prevent evaporation. However, according to a new research reported in the Nature Sustainability journal on July 14, 2018, more water was used for manufacturing the balls than was saved by deploying them, resulting in a net detrimental effect on the environment. During the latter part of the drought, the balls were deployed on the reservoir for 18 months. However, the study predicts that for each water drop saved by the balls, more than one drop would have been used up in a different part of the country or the world. Shade balls are produced using a type of plastic that needs natural gas, oil, and electricity to manufacture, all of which need huge amounts of water. Approximately 2.9 million cubic meters of water is needed to produce 96 million balls with a standard thickness of 5 mm. However, when deployed in reservoirs, the balls save an estimated 1.7 million cubic meters of water. Based on this data, researchers from Imperial, MIT, and the University of Twente predict that it is necessary to deploy the balls for 30 months before the water saved matched the water used. However, this would be valid only if evaporation is prevented at the same rate even other than the dry period; outside the drought conditions, it is anticipated that the balls will be less efficient at preventing evaporation, indicating that they must be deployed for a longer period to save as much water as was used. This is in addition to other potentially detrimental impacts on the water, such as potential unfavorable environmental effects related to carbon emissions or water pollution. Since it is forecast that more frequent droughts and more extreme temperatures will occur as a result of climate change, water management will turn out to be a crucial topic in the future.